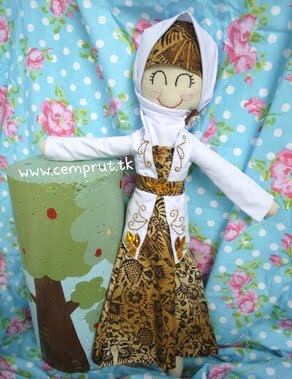 c e m p r u t: the luchie's loro blonyo doll...!!! 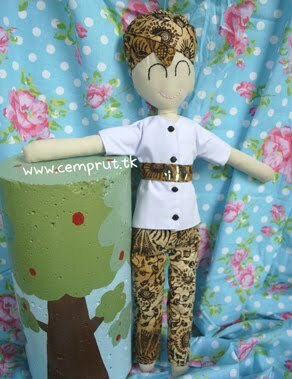 yay... another loro blonyo dolls :) when u don't even know yet about the loro-blonyo so u can check my previous post in here !!! 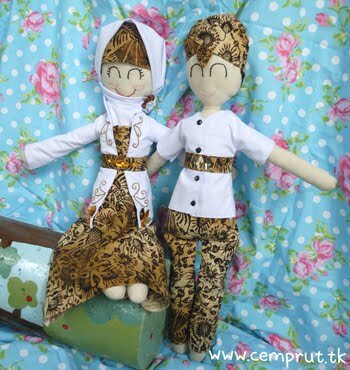 now it's time for Luchie's Loro Blonyo, i'm not sure yet who's gonna married, she or her cousin, whoever is it i give a pray for both of the wedding couple, happy eva aftaaaa... :p luchie wants the doll is wear an batik as a national fabric from Indonesia, the bride wear a white kebaya and a white hijjab. i put an obi and a goldie stone for makin the kebaya is more looks elegants. oh when u dunno et what is kebaya, kebaya is a traditional dress for woman in Indonesia.